Often, we refer to certain cuisines as a whole despite the prevailing regional variations within the originating country. For example, we often think what is served in most Indian restaurants as representing the food for all of India. If India was only the Punjab, that would be correct; but it isn't. Same goes with Chinese food. What we usually see here is a variation of Cantonese food. That is only one small Province in all of China. Same can be said about other cuisines as well including French food. Food served at La Brasserie hails from the Alsace-Lorraine region along the French German border. It brings together French technique with German influences. Then we have Provence Marinaside which serves up food from the South that boasts an abundance of seafood. We have modern French cuisine such as Lumière where portions are modest; but care and minute details are paramount. 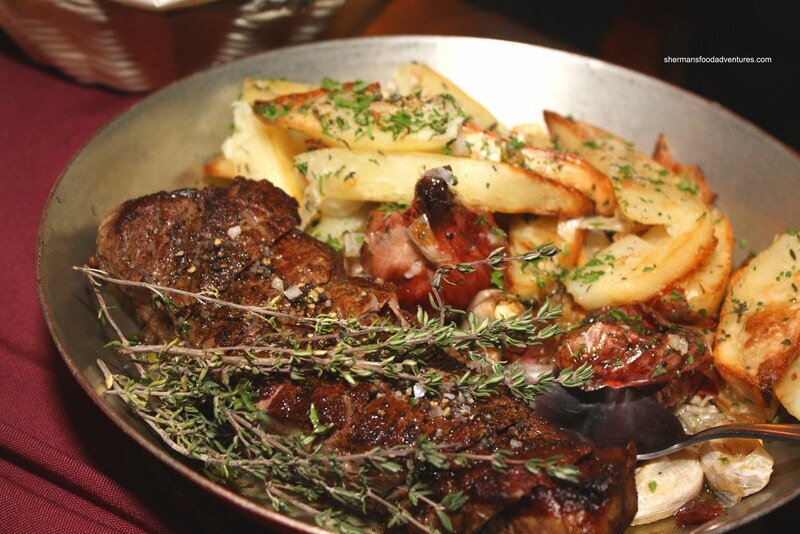 For something a little more country, we have Le Régalade which serves up more rustic-style dishes that are both large in size and bold in flavours. Darina suggested we head over to West Vancouver to try out this popular bistro and seeing how Whipping Girl likes to eat, she tagged along as well. We started off sharing 3 appetizers. 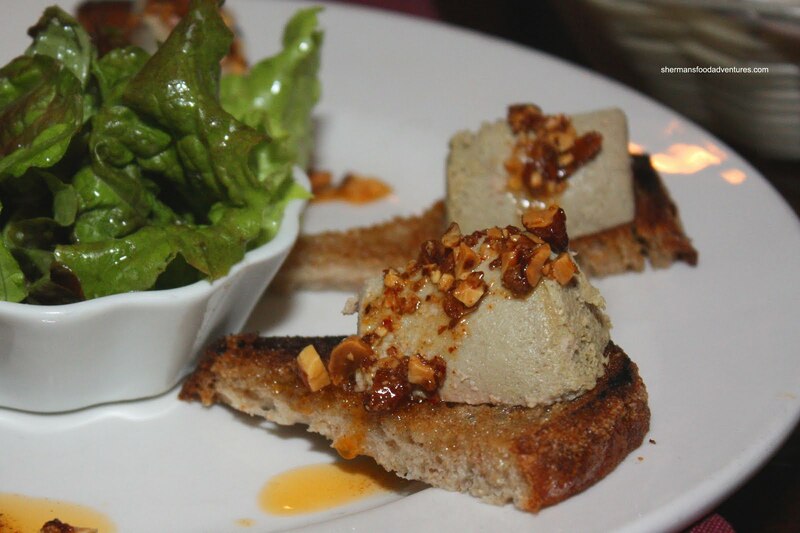 From the roaming fresh board, I only had my sights set on one item which was the Duck Liver Mousse Crostini. For $11.50, I figured it would be a small amount of mousse with a few crostinis. How very wrong I would be. Try 6 large triangles with a clump of mousse that is bigger than a marshmallow. Topped with sweet, roasted almonds, the darn thing was rich and absolutely delicious. Since it was a mousse, the duck liver was very light; yet had all the taste elements of duck liver. The crunch and sweetness from the crushed almonds was a nice textural addition to the melt-in-your-mouth mousse in addition to the crisp crostini. I can't believe this fabulous appetizer was only $11.50! That's a calamari at Cactus Club! Darina wisely selected the classic Gratinée Lyonnaise (French Onion Soup). 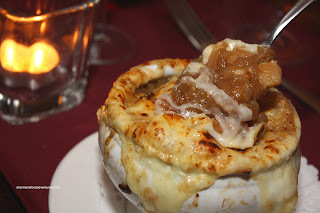 Served in a fairly large bowl, the soup came steaming hot and topped with an obscene amount of Gruyere. Diving into the soup yielded plenty of caramelized onions which in turn resulted in a rich, sweet broth. Lots of depth and not salty at all, the soup was much better than the last one we had at Jules. Whipping Girl went for another classic in the Les Escargots en Croûton. 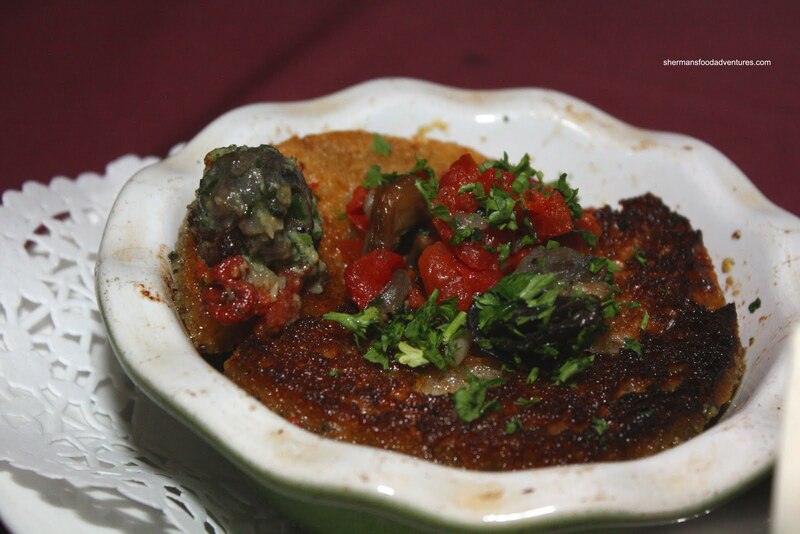 Buttery, garlicky and not for the feint of heart, this was everything that this dish is about. Resting in a pool of garlic butter that can strike fear in your arteries, the escargots were the right texture. The large croutons on top did their job and soaked up all the buttery goodness. I particularly liked the fresh tomatoes on top which somewhat helped cut the richness. Mind you, we needed a whole bowl of lemons to cut all the richness because we were overly ambitious and ordered 3 whole meals as well. You see, the portions at La Régalade border on the insane. Dare I say it can even make some American restaurant portions look modest. Now look at exhibit A aka the Roast 1/2 Duck with sautéed fruit with a side of Gratin Dauphinois. The skillet had to be 10" and it was pretty much filled with food. Furthermore, the duck was very meaty and large. Eat all this myself? Not a chance. Portion-size is one thing; yet the execution was equally as good. The apples and grapes were perfectly cooked as they still retained their texture and integrity while being caramelized. The resulting sauce was naturally sw eet and complimented the duck. About that duck... oh, it was good, so good I wanted to eat it all. Alas, that was not possible, even for me. The tender and moist flesh was surrounded by beautifully rendered skin. Combined with the fruit, it was sweet, savoury and delicious. 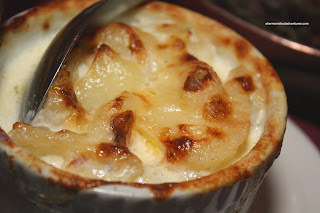 The accompanying Gratin Dauphinois (scalloped potatoes) were ever so rich with butter and cream. The potatoes were on the softer side and I would've preferred a bit more impact in terms of flavour. I could only finish 1/4 of it, it was very rich. 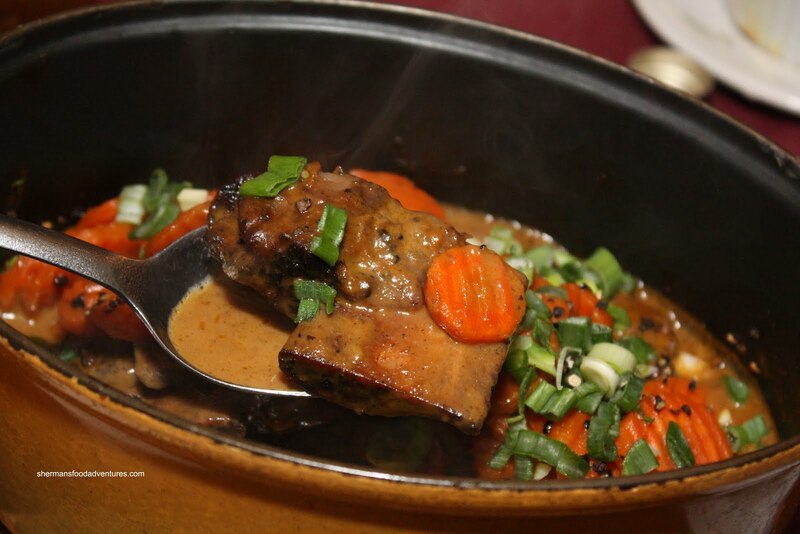 Whipping Girl went for the Beef Short Ribs with Peppercorn Sauce served in a cocotte. 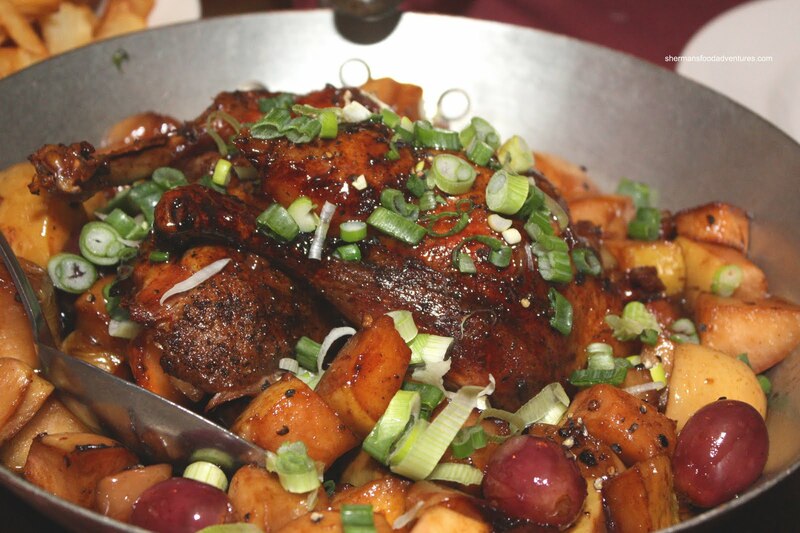 Once we dug into the mixture of carrots and short ribs, it yielded nothing but food. Sure there were a few bones; but most of it was meat. Whipping Girl was full after one large rib. I got to try it and the sauce made the dish. When they say peppercorn, there was no mistaking it was peppercorn. Lots of pepper flavour in this rich sauce that had loads of depth. It was neither too salty or sweet. It was just right. 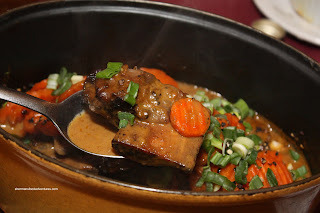 The silky balanced sauce enhanced the already tender and flavourful ribs. Darina loves steak frites so she only had her eye on the Piece de Boeuf Grillée aux Échalotes, Ails et Pomme de Terre (which is grilled prime rib with shallots and garlic accompanied by potato confit). The steak was tender and slightly past medium-rare. For me, it could've been more moist considering it is a fatty cut of meat. The accompanying cooking jus was quite oily; but captured all the meat flavour with the garlic and shallots. Definitely amped the flavour quotient of the meat. The potato confit was also very rich since it was cooked in duck fat. Only slightly crisp, it was fluffy soft inside. Undeterred by the fact we ordered enough food for 6 people, we added a side of Frites for good measure. 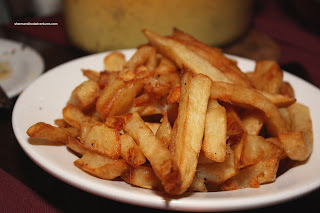 The frites were only okay for me. Not particularly crisp with a few bigger pieces being limp, I could've done without them. With that being said, some of the smaller pieces were quite good. They didn't have any mayo; but provided some Béarnaise sauce for dipping. That was yummy! At the end of our meal, we were stuffed beyond belief due to the portion size and the richness of the food. And this was eating only HALF of the dishes each! Despite this, we were game. We still wanted dessert! Well, since all of the desserts are proudly displayed on the counter at the front didn't help either. The power of suggestion or possibly the fact we have no will-power. 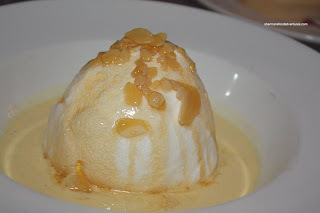 For me, the île Flottante was staring at me all through dinner. Known as the "floating islands", it is essentially a meringue with caramel and almonds floating atop crème anglais. Despite looking like a large dessert, it was in fact very light. Collapse the meringue and it ia fluffy with sweet caramel and semi-sweet vanilla custard. I quite liked this dessert. Darina went for the Tarte Tartine which is an upside-down apple tart. 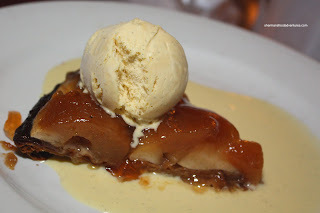 The apples are caramelized with butter and sugar, then baked. The result was a sweet and rich tasting apple tart. With a dollop of French vanilla ice cream on top, this was very bad for ones' health! Whipping Girl opted for one of my favourites in the Lemon Tart. I found that the pasty shell to be on the thicker side and a bit stiff. 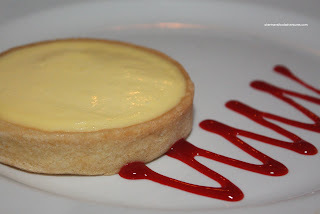 However, the lemon filling itself was perfect in my books. 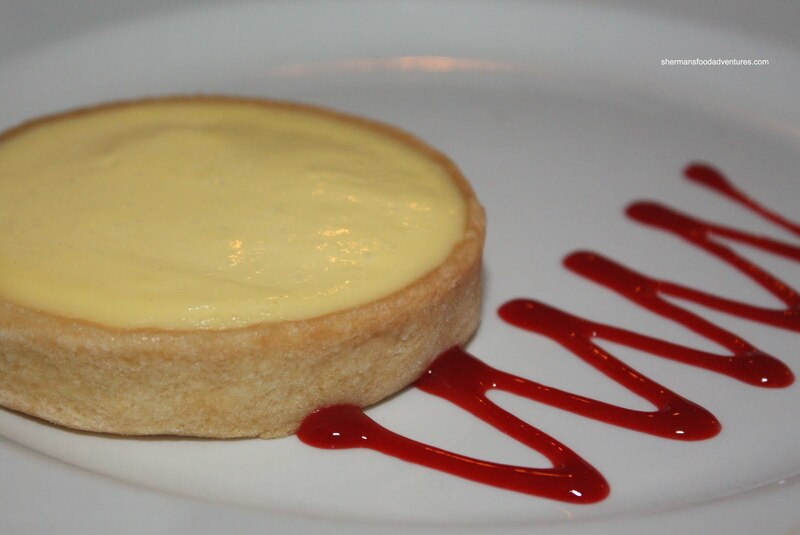 With the right consistency and enough impactful lemon zing, it made the dessert. In terms of the entire meal, I would say that despite the relatively high prices, the portion sizes make up for it. 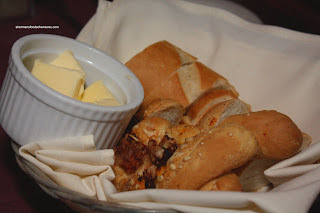 One appetizer and one entree can easily feed 2 people I'm not exaggerating! Now, if you were expecting refined French cuisine, you might want to look at Lumière and La Belle Auberge. 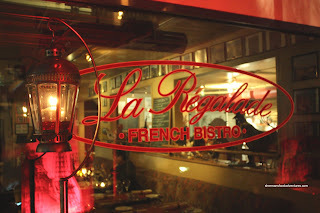 The food at La Régalade is very much country style. Furthermore, the food is extremely rich. They do not hold back with the butter. Now some things ended up to be better than others. However, that is usually the case with most restaurants. I'm not going to nit-pick here because I would definitely return for another meal. Sorry I skipped this one. But, man, the food looks good. Now I need a "volunteer" to tag along next time, hmmmm... Now, how was the layout of the dining room compared to Jules? I am ready to go back to la Regalade anytime. Good ol' rustic French country cuisine--my favourite. I was surprised by the portions as well, and happily so. The room is small and crowded, just like a French brasserie; it very much had that same feel. I go to Jules quite often and like that room better. all in all, I love the food at LR. OMG! *Drools* I want to go to this place! I <3 French food! Dude, what happened to our good ol' food adventures?! I often forget about La Regalade when I think French (Terre-a-Pied, Les Faux Bourgeois, Salade des Fruits, La Belle Auberge, etc) because they're way out in W. Van. Thanks for the reminder. I've only been there once but we loved it. I even bought a copy of Alain Raye's cookbook (autographed) at a cooking course he taught at The Cookshop. Kim, the layout of the place is quite cramped compared to Jules. But it is bigger. Darina, I love the place. One of my new favs. I'm going to return but order more appropriately next time. Anita, name a place, we'll go! LR, we do forget about places that are hidden don't we? That's why I like to go everywhere!